This site-specific project, conceived by Christine Sciulli and Bastienne Schmidt, takes on the tradition of the Exquisite Corpse as a collaborative action drawing-in-space, constructed and manufactured in-situ with ropes, threads and textiles. Referencing the drawing-in-space tradition of Eva Hesse, Sheila Hicks, and Fred Sandback, invited artists will engage their own practice in a ricocheting handoff to create a three-dimensional drawing – weaving and subsuming their contributions during the seven weeks of the exhibition to generate a large-scale spatial installation completed by the show’s closing. This piece invites discussion of conventional notions of authorship to explore the contemporary necessity of collective making. “Handoff” artists include Louise Eastman, Sabra Moon Elliot, Saskia Friedrich, LoVid, Toni Ross, Bastienne Schmidt, Christine Sciulli, Morgana Tetherow-Keller, Virva Hinnemo and Almond Zigmund. 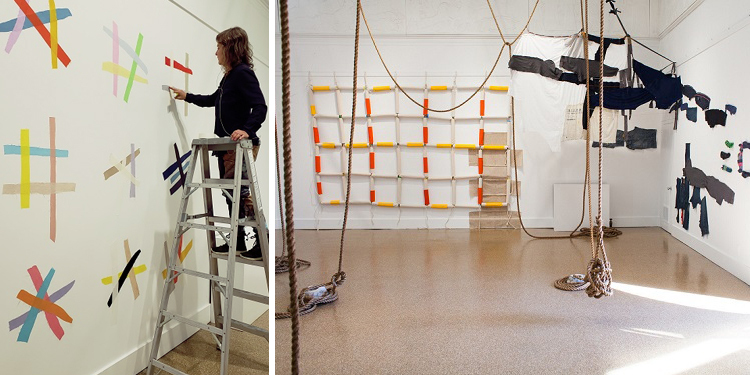 Shown above on left Saskia Friedrich installing, on right installation view. Join us along with the artists from HANDOFF: Weaving in Space as we celebrate the completion of this dynamic collaborative exercise. Refreshments will be provided. Handoff will be on view through Sunday, April 14. FLAT FILE featuring recent works by: Željka Blakšić, Ross Bleckner & Frederic Tuten, Victoria Burge, Anderson Ranch Editions/The Haas Brothers, Richard Dupont, Louise Eastman, Nick Lamia, Rachel Ostrow, Lanie McNulty, John Mitchell, Janis Stemmermann and the Victory Garden Collective. Victory Garden Collective is Louise Eastman, Jess Frost, Tara Geer, Katie Michel, Wendy Small, and Janis Stemmermann. Proceeds from the sale of these prints will go directly to Action Potluck, where they will be used to support the legal efforts needed to keep families together. Victory Garden Collective is Louise Eastman, Jess Frost, Tara Geer, Katie Michel, Wendy Small, and Janis Stemmermann. A field trip to the Josef and Anni Albers Foundation - seeing Anni Albers weavings and prints side by side - was the inspiration behind PRINT/WEAVE. Under Louise Eastman’s curatorial direction, Jamie Boyle, Molly Haynes, along with Louise herself, have been in residence this fall season making prints on the press at Russell Janis. In this creative experiment, we wanted to let the sculptural act of the printmaking process embrace the materiality of weaving. Crossing over from loom to press, fabric to paper, the tactile functions of the cloth used are irrevocably changed and transformed, releasing new potential in the way a textile can be experienced. VOTE, 2018 is an 8-piece napkin set printed in shades of blue, newly released by Planthouse and the Victory Garden Collective. Designed to encourage awareness during some of the most challenging issues of our time, this set of silkscreened napkins is packed in an 8 inch box to take along to friends and family gatherings. The Victory Garden Collective is Louise Eastman, Jess Frost, Tara Geer, Katie Michel, Wendy Small, and Janis Stemmermann. For more information and to purchase, please click here. For this year’s Brooklyn Clay Tour, Russell Janis will be hosting FROM THE GROUND UP, an installation of clay works and video documentation from a pit fire on Nantucket as well as recent print projects from the Russell Janis Studio. Participating artists works by: Lauren Berodt, Maggie Cooley, Tara Douglas, Louise Eastman, Michael Gundlach, Monika Johnson, Kathleen Kucka, Danielle Pomorski, Pedro Ramirez, Wendy Small and Janis Stemmermann. A ceramics group show including Louise Eastman, organized by Jessica Perelman, exploring the decorative and the culture language to comment on conversations of power, identity and relationships to one another. The Victory Garden collective and Louise Eastmans' project “Say a Little Prayer for U.S.” was featured in a recent Art in Print article: It’s All Political, by Susan Tallman. Work by the Victory Gardens Collective is currently on show in + THE ART OF COLLABORATION at the Beinecke Rare Book and Manuscript Library at Yale University. The show has been reviewed in the New Haven Register by Joe Amarante. There’s an endless discussion on sports radio about the value of top football quarterbacks vs. the team around them: Tom Brady is supreme; Tom Brady needs the great coach and team around him. The answer, of course, is you need both. Which brings us to the literary and artistic exhibit “+ The Art of Collaboration” at the Beinecke Rare Book and Manuscript Library at Yale University through April 15, curated by the Beinecke’s Melissa Barton, Elizabeth Frengel and Nancy Kuhl. Kuhl produced the jewel-box vitrines (display boxes) on the long sides of the mezzanine that feature 18 instances of American literary and artistic collaboration spanning more than 100 years. These include vaudeville comedian Bert Williams and George Walker; Gertrude Stein and her partner/muse Alice B. Toklas; the Dada-movement parlor game “Exquisite Corpse”; August Wilson and Lloyd Richards; and the Victory Garden Collective, which made for the 2017 Women’s March cheeky sashes meant to evoke beauty queen and suffragette sashes (with sayings such as “Miss Governed” and “Miss Led”). This summer Louise Eastman was featured at Graficas Gallery’s Focus on Clay, along side Angela Cunningham, Susanne Greene, Dani Henki, Miranda Howe, Pedro Ramirez and Bonnie M Smith. Another art project for protest by the Victory Garden Collective. Available now at Russell Janis Gallery.